Nissan celebrates 50 years of the legendary GT-R with new Nismo and Anniversary models. The Nissan GT-R is celebrating its 50th birthday, so we thought Nissan would have something special planned like an all-new model. Instead, the Japanese automaker is rolling into the 2019 New York Auto Show with a special 50th Anniversary Edition and a new Nismo model for the 2020 model year. For most markets, the 2020 GT-R will be available in Premium, Track Edition, and Nismo trims while select markets will also receive Pure, Prestige, and Black models. 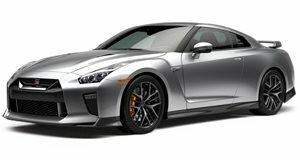 Buyers who select the 50th Anniversary Edition will be able to choose from three two-tone exterior colors based on Nissan's most historic GT-R colors. Pearl White with red stripes and Super Silver with white stripes sound like interesting options but the coolest color by far is Bayside (Wangan) Blue, which has been retired from use since the R34 GT-R. The blue paint is given a four-coat, double-heat treatment process to ensure a vivid look, which is capped off with blue accents on the wheel spokes. The interior of the 50th Anniversary Edition is finished in a special gray color, though Nissan says this scheme will be available on other models as well. Additional 50th-anniversary touches include unique steering wheel and shift knob trims, embossed seats, an Alcantara headliner, and Alcantara sun visors. Under the hood, the 3.8-liter 24-valve twin-turbocharged V6 engine has been updated with new turbos and exhaust manifolds, allowing sharper engine response in and out of corners. The six-speed dual-clutch transmission now has a refined "R mode,” which offers more aggressive downshifts to predict cornering exits and creating a more intuitive automatic mode. Power and torque remain the same at 565 hp and 467 lb-ft respectively, enabling a 186.4 mph top speed. Although the engine doesn't produce any more power, it will sound better courtesy of a new titanium muffler with blue tips. For the first time ever, the Track Edition will borrow the tuned engine from the GT-R Nismo, producing 600 hp and 481 lb-ft of torque courtesy of redesigned turbochargers from the GT3 series GT-R race car. The Track Edition can also be optionally equipped with Brembo carbon ceramic rotors and calipers and a carbon fiber roof. But if you want the most extreme GT-R of the bunch, the Nismo trim still reigns supreme. Nissan has differentiated the Nismo with copious amounts of carbon fiber including the front and rear bumpers, front fenders, hood, roof, side sill covers, trunk, and rear spoiler. The exterior carbon fiber alone saves 23 pounds while the whole car shaves 44 pounds from other models thanks to various other upgrades and new components. This new GT-R Nismo looks more reminiscent of the GT3 GT-R with scalloped vents that are designed to funnel hot air away from the engine bay and provide downforce onto the front tires. Pricing hasn't been announced but we expect it to be close to the outgoing 2019 GT-R.